Learn About Copyright in Canada and the U.S. Literally, the definition of copyright is the right to copy. Copyright describes the legal rights of the owner of intellectual property. The person who owns the copyright to work, such as song lyrics or an original drawing, is the only person who can copy that work or give permission to someone else to copy it. According to Canada's Copyright Act, copyright is "The sole right to produce or reproduce a work or any substantial part thereof in any material form, to perform the work or any substantial part thereof in public, or, if the work is unpublished, to publish the work or any substantial part thereof." 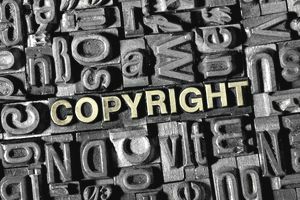 In addition to being able to assign their copyright, license it, or use it for funding, copyright holders may also collect royalties when others use their copyrighted work. Copyright differs from other intellectual property in that copyright is automatically created when a person creates a copyrightable work that is an original literary (including software), dramatic, musical, or artistic work. There is no need to register such an original work in order for it to "be copyrighted." As soon as an individual creates an original piece of art, for example, they have an automatic copyright on the resulting work. However, you can register your copyright if you like. The Canadian Intellectual Property Office says that "Copyright in a work exists automatically because a certificate of registration is evidence that your creation is protected by copyright and that you, the person who registered it, are the owner. Thus, the registration can be used in court as evidence of ownership." The governments A Guide to Copyrights explains the registration process in depth. Also, copyright, unlike other intellectual property rights, is automatically applicable to many countries which have copyright treaties with Canada (such as the United States). Because quite severe penalties exist for copyright infringement, knowing what your copyright rights are is important so you don't violate the copyright of others. Exactly What Can be Protected by Copyright? Writings of almost any kind – books, articles, reviews, poems, essays, blogs, etc., whether online or in print. Also includes plays and writings for movies or broadcast. Website contents – including text, pictures, graphics, and even the page layout. Computer programs – including business, personal, and entertainment. Motion pictures – movies, TV programs, podcasts, etc. Music – including lyrics and instrumentals. The owner of the copyright has exclusive rights to copy or perform the music or assign the rights to others. Artistic works – visual arts of any kind including paintings, drawings, sculptures, etc., but also including graphics, maps, charts, and photography. Original architectural designs – including designs for municipal, commercial, and residential buildings and ​structures such as bridges, highways, and tunnels. Copyright duration varies from country to country. In Canada copyright lasts for the duration of the creator's life plus 50 years from the end of the calendar year of the creator's death. In the United States and the United Kingdom, copyright lasts for the life of the creator plus 70 years. In the computing world, one of the most famous copyright infringement cases involved Apple Computer filing suit against Microsoft in 1994 after various releases of Microsoft Windows operating system. Apple claimed that the graphical user interface (GUI) of the Macintosh operating system was protected by copyright and that the similarity of some aspects of Windows constituted copyright infringement. The suit was further complicated when Xerox filed a lawsuit against Apple claiming that Apple had used elements of Xerox's GUI design in the Macintosh OS. Apple had previously licensed individual elements of the GUI design to Microsoft. Other elements of the GUI design came from Xerox (and were therefore not original). The "look and feel" of the GUI could not be copyrighted.